We held the 145th Annual Meeting of Ex Officio Trustees and Special Guests in beautiful Louisville, Kentucky. We have been meeting here consecutively since 1870. Teacher Talks: We held four informal "Teacher Talks" in the Products Showcase area. Four dynamic educators talked to an intimate audience about how they use APH products in the classroom. Tactile Town: Kristie Smith, TVI from Texas, discussed how she uses Tactile Town with her students. 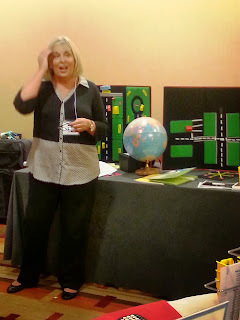 Smith has also written several blog posts about teaching with Tactile Town and other APH products. Orion TI-84 Plus TGC: Susan Osterhaus, TVI from the Texas School for the Blind and Visually Impaired, demonstrated the capabilities of the first fully accessible graphing calculator. SAM: Symbols and Meanings: APH Consultant Millie Smith talked about SAM: Symbols and Meanings, which she helped create. She noted that young children are fascinated by the names of things, constantly asking what something is named. SAM fulfills that need for children who are blind and visually impaired. Kevin O'Connor, senior lecturer at Loyola University, and faculty at Columbia College in Chicago, spoke to the audience about water. Yes, water. He told us that water always beats rock—water rolls right over rocks and obstacles. He asked us who played the role of water in our lives. He candidly told us that we, the blindness community, acted as water for him and his family when their newborn son was diagnosed as being blind. A very powerful, moving keynote address left no one with dry eyes. The Virgil Zickel Award recognizes those creative individuals from outside APH whose ideas result in the development of innovative products designed to improve the quality of life for people who are blind and visually impaired. The first of this year's Zickel Awards went to Texas Instruments for their help in developing the Orion TI-84 Plus TGC. Accepting the award on behalf of Texas Instruments was Peter Balyta, Executive Director of Worldwide Marketing. 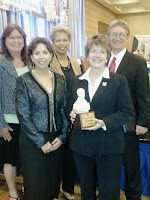 Read the press release on the award. General Session I: We awarded two more Virgil Zickel awards. One went to Millie Smith for her work with SAM: Symbols and Meanings. 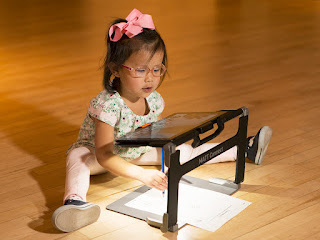 The other went to Ellen Trief and the Lavelle Fund for Standardized Tactile Augmentative Communication System (STACS). The REAL (Resources with Enhanced Accessibility for Learning) Plan, which was initiated to ensure that students receive high-quality, accessible educational materials on time. Online assessments being developed by the PARCC and Smarter Balanced consortia. Future enhancements to the Braille Plus 18. 3-D printers and haptic devices, possibly the future of tactile graphics. General Session II: We introduced the 2013 APH Scholars and heard an update on Unified English Braille and BANA from the esteemed Mary Nelle McLennan. The audience was honored to hear the story of a young woman whose life was forever changed by the National Prison Braille Program. She told us that learning to transcribe braille was what she had been looking for her whole life. Her story was truly touching. The Creative Use of Braille Award was presented to the Ohio State School for the Blind Marching Band for their BrailleScript "OHIO" performed with The Ohio State University Marching Band. Stay tuned for a summary of Friday night and Saturday at Annual Meeting 2013!